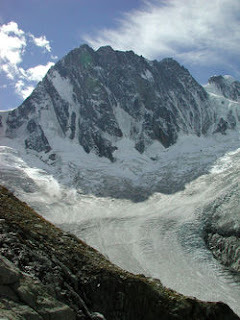 The Grandes Jorasses (4,208 m) is a mountain in the Mont Blanc range. The first ascent of the highest peak of the mountain (Pointe Walker) was by Horace Walker with guides Melchior Anderegg, Johann Jaun and Julien Grange on 30 June 1868. The second-highest peak on the mountain (Pointe Whymper, 4,184 m) was first climbed by Edward Whymper, Christian Almer, Michel Croz and Franz Biner on June 24, 1865, using what has become the normal route of ascent and the one followed by Walker's party in 1868. The other summits on the mountain are Pointe Croz (4,110 m), Pointe Margherita (4,065 m), Pointe Elena (4,045 m) and Pointe Young (3,996 m). Located on the French side of the mountain, the north face is one of the six great north faces of the Alps. One of the most famous walls in the Alps, it towers 1,200m above the Leschaux Glacier, stretching 1 km from end to end. The classic route on the face is the Walker Spur (Cassin/Esposito/Tizzoni, 1938, TD+/ED1, IV, 5c/6a, A1, 1200m) which leads directly to the summit of Pointe Walker. The other major buttress on the mountain is the Croz Spur, which leads to the summit of Pointe Croz. In her solo ascents of the six north faces, Alison Hargreaves chose this route in preference to the Walker Spur.